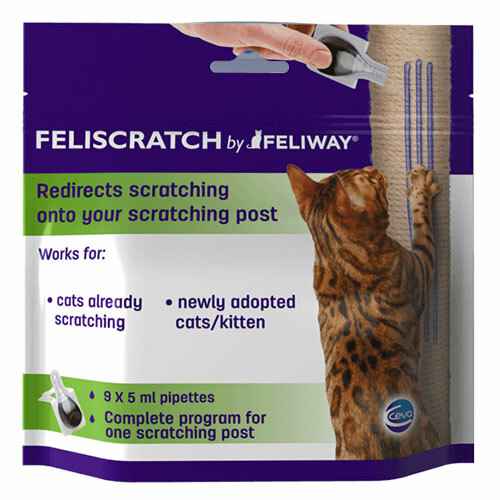 Feliscratch by Feliway is an advanced product that is used for cats to prevent inappropriate scratching. This new product can help teach your cat to use a scratching post. When a cat scratches, they tend to leave behind scent markers from their paws onto the scratched areas causing frequent scratching. Feliscratch imitates that pheromone, so applying the contents on the scratching post encourages your cat to use it. The efficacy of this product is clinically proven and helps reduce marking behaviour. Feliscratch contains Feline Interdigital Semiochemical analogue, Catnip and Excipients that allows your cat or kitten to express their natural need of scratching by redirecting them to their scratching post. It works for both horizontal and vertical scratching and lasts for upto 4 weeks. Apply the contents of one pipette to the scratching post once daily for 7 days. Then once one week later and another one week after that. Place the post horizontally on a sink or newspaper and apply gently by drawing 2 or 3 lines. Wait for 5 minutes for it to dry before replacing the post vertically. Position the post close to the area where your cat scratches. Keep away from children and other pets. Avoid contact with fabrics, furniture or carpets. Safe to use on cats and kittens.